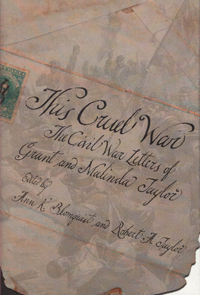 In 1862, Private Grant Taylor of the 40th Alabama Infantry regiment began writing home to his wife Malinda. Thus started an almost three year correspondence of some 160 letters that chronicle the impact of the American Civil War on one rural Alabama family. For the Taylors and their kin, the war brought precious little glory or sentimental notions of causes won or lost. Their rough prose provides more evidence of the downside of the Civil War experience that is historically significant and emotionally touching.